Steven Butala: Steven and Jill here. 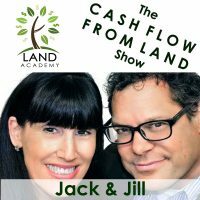 Steven Butala: Welcome to the Land Academy Show, entertaining land investment talk. I’m Steven Jack Butala. Jill DeWit: And I’m Jill DeWit, broadcasting from sunny, like my shirt, yellow, sunny southern California. Steven Butala: Today Jill and I talk about starting with the budget. It is imperative that you start all this stuff staring at a blank, blinking excel spreadsheet. Jill DeWit: I have a funny story. Steven Butala: I can’t express it enough. Should you tell it now? Jill DeWit: I have a funny story real quick about a budget. My mom let my dad handle the budget for a brief time during their marriage. It was the funniest thing. Jill DeWit: Yeah, it was only a short time that he did this, because here’s dad’s way of doing the budget. When the money came in every month, all the fun stuff happened. Trips got planned. We bought things. We had all this stuff, and then at the end of the month dad would sit down and try to pay the pills with what was leftover. As you can imagine, it was a disaster. It was a disaster. Steven Butala: She took it away. Jill DeWit: She took it away. Steven Butala: Like your mom. Steven Butala: Not your mom, but like a mother. So, the other thing I have to say, ’cause this is funny, this is important, was grocery shopping. I loved grocery shopping with my dad. We bought Ding Dongs. We bought root beer. We bought popcorn. There were no fruit and vegetables, no way. All the good stuff. So, my mom took that away from dad too. Steven Butala: Hold on a second. Jill DeWit: Those of you, you know, I wonder if anybody knows what a Ding Dong is now. I mean, our kids don’t eat Ding Dongs. Steven Butala: Of course, they’re Ho Hos or whatever. Jill DeWit: Dad loved Ding Dongs. Steven Butala: They’re donuts. They’re worse for you, not fresh donuts. Jill DeWit: It was brown, wrapped in foil, in a box. Ding Dongs rock. Jill DeWit: I have wondered that later on. I thought, Oh yeah, I’ll do the grocery store shopping. Then she won’t ever ask me again. [crosstalk 00:02:30]. It’s like, I’ll do the dishwasher, and no one will know where anything is, and half of them are broken. Steven Butala: Crash this train, so I don’t have to drive again. Jill DeWit: Takes a lot. So this why I always have to make the bed. Just kidding. I don’t. Steven Butala: I make the bed more than half the time. Steven Butala: Before we get into this though, let’s take a question posted by one of our members on the landinvestors.com online community. It’s free. Steven Butala: Oh, that little detail. Jill DeWit: “… will this make a property difficult to sell? For anyone who has any experience around this, so it would be appreciated. Thanks.” Wow. Steven Butala: Go ahead, Jill. Jill DeWit: I’m a little worried. Jill DeWit: Yeah, the gas, he said, “gas,” right? Yeah, that’s got EPA and envir- … What’s this? This is all environmental. Lord knows, or industrial, I mean. Steven Butala: Hold on. You found a piece of property that has, probably a functioning gas well on it, with a huge company behind it, that’s leasing the property from the current owner. All right, so let me tell you, just run. Unless you want to be in the energy business and get all into that, and there are some people that love it in our group. There are people that seek this kind of property out for a lot of reasons. They’re into it. All it’s gonna do is make that property, for what we do here, more difficult to sell. I know that there’s a sentiment about oil and gas and how profitable it can be, and there’s a rich history in Texas and California about all of this, and all of that’s true. It’s just not the business that I’m in, so I avoid this kind of stuff. Jill DeWit: That’s not our business. Steven Butala: Half the people who are listening to this, they’re saying, “What are you talking about, you’re not going to buy a property that has mineral value to it?” Maybe you’re right for you, but all it is, is a distraction for us. We buy property and resell it over and over and over again for more money, and that’s our whole business model. Anything on it, including a gas well, just, it gets in the way. I don’t know how else to say it. Jill DeWit: That was perfect. Steven Butala: Today’s topic, start with a budget. What does that actually mean? This is the meat of the show. Jill DeWit: What does this mean, Steven? Steven Butala: Everything in my life starts with a blank spreadsheet. How much revenue can generate, how much expense we’re going to incur, what’s leftover, how long it’s going to take. Jill DeWit: Relationships. Think I’m kidding? Steven Butala: Truth be told, here’s what I do after I’m done spending all his time on this beautiful budget. I cut the revenue in half, by increased expenses, by 100%, and I still see if I want to do it. It’s been very few things pass the test after that, or you go into it knowing you’re gonna lose money. Sometimes when you’ve got one company that’s making so much money, you need a company that’s going to lose money then, but still budget it out. Steven Butala: From that budget, let’s say I wanted to get into land business. I want to make 100,000 bucks a month. It’s not going to happen in the first month or maybe it is. However, whatever happens, budget yourself up. Budget your time, too. Put your time into constraint. Budget money. Budgeting money is obvious. Budgeting how many hours you have in a day, especially if you’re married with children and you have a job, you gotta be really hypersensitive about how much time you can spend. It’s all possible. We have multiple success stories in our groups now. There’s groups who gotten over this. Every single one of them have sat down and microscopically managed and followed a budget. Jill DeWit: I see the value in this for two reasons. One, like what you just said, you want, A, mixture that works. And B, you need to really fully assess what you need to contribute here, and is this gonna be realistic for you? Because I like that. Steven Butala: I love it, Jill. Jill DeWit: It’s not just the money part of it. Like, “All right, I know what I got to put in to get this out of it.” The extra piece that you added, that really sings to me, is my time. Do really have the time to do this? Okay, if I want to make this much money a month, I’ve got to flip these many deals. Now, I need to flip these many deals. I need to set up this much mailer. If I need to set up this much mailer, I have to spend this much time putting together a mailer, you know, backwards, backwards, backwards. And that means I need two full eight hour days in my study. Am I willing to give up that weekend? You know, all the things you have to do to get to that point. It’s not that you can’t do it. You want to go with your eyes open. And by the way, please share this with your family. The people important to you, you know, get them all … That’s my other thing, too. Everybody’s got to be on the same page. Steven Butala: Here’s an example. I’m going to keep this real simple. Let’s say you do want to make 100,000 bucks a month, and you’ve already spent six months learning. You’ve gone through the programs that we have. You’ve done a lot of research. Maybe you flipped a few houses already, so you’re bringing that to the table and you know what you don’t want to do. You don’t want to renovate a house anymore, and you want to make 100 grand next month. Well, you know that you have to send out for about 4,000 to 5,000 letters. They have to be priced right, but let’s say you’re past that. So now you’re sending out 4,000 to 5,000 letters in southern California, for houses that are 1.2 to 1.5 million, and your whole goal is to buy a property for 1.2, off market, completely off market, and somebody’s in a situation where you know you’re getting it for a good deal. Then to resell it on the MLS, immediately for 100,000 bucks more, 110,00 or 120,000 or 130,000 bucks after fees. Then you want to do it over and over again. You want to do one of those a month to make 1.2 million bucks a year. Very, very realistic goals for the right person, and you only have Sunday to do this. You got a real job and all this. It’s all possible. Absolutely possible. It just takes a bunch of planning. You have to contingency plan for when things don’t go don’t work. Jill DeWit: Right, budget a cushion. Steven Butala: For me, budgeting takes all the stress out of it. Hey, that’s so healthy, number one. And then, number two, budgeting your time and your life. You need to plan on, something’s going to come up at least 25% of the time, or whatever you budget, be ready for it, because the last thing you want to do is be behind and kicking yourself. Jill DeWit: And throwing up your hands and saying, “I’m a failure. I can’t do this.” No, budget, budget for it. Things happen. It happens to us. Steven Butala: Yeah, deals fall through. Maybe you have to do two deals. Steven Butala: Take two deals all the way fruition for one of them to actually close. That’s fine. Jill DeWit: Yeah, that’s okay. Budget for that, and tweak your budget as you go, by the way, don’t be afraid to … don’t have to stick to it. You can manipulate it as you go. Steven Butala: Yeah, if you like to watch sports on Sunday, knock that out. Don’t knock out time with your kids and stuff, especially if they’re little. It’s just, all I’m saying is, if you really sit down and budget it out and be flexible, because it never actually happens how you think, just the fact that you’re writing it down and planning for it dramatically increases your chances of it actually happening. Jill DeWit: It’s that amazing? Steven Butala: Wow. We won the lottery. That’s lucky. Jill DeWit: It took us years. Steven Butala: We planned for all this. Steven Butala: And we work at it. Even now, like we’re doing a show, you know, so it’s not, it’s not because I’m incredibly bright. It’s just because we’re organized, and we have a budget. Jill DeWit: Stop. It’s because you have great hair. Steven Butala: Yeah. You have low standards, and that’s awesome. Steven Butala: Yeah. My onscreen charm is why we’re here. Steven Butala: Boy, if we had to depend on that to eat, we’d be done tomorrow. Jill DeWit: Okay. Thank you. Well, you’ve done it again, you’ve wasted another, I don’t know, 15 minutes listening to the Land Academy Show. 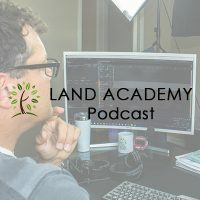 Join us next time, when we have another interesting episode, and we answer your questions posted online at landinvestors.com, our online community. It’s free. Steven Butala: You are not alone in your real estate ambition. Thanks for the save there. Jill DeWit: You were just overwhelmed by the compliment, I’m guessing. Steven Butala: We were reversing our roles, which is … Now I’m learning a bad idea. Should just stick to my stuff. You stick to your stuff, and we’ll count the money later, together. Jill DeWit: Deal. Share the fun by subscribing on iTunes, or wherever you are listening or watching. Maybe it’s YouTube, and while you’re at it, please rate us there. Steven/Jill: We are Steve and Jill. Steven Butala: … to buy undervalued property. If you have any questions or comments, please feel free to email me directly at steven@BuWit.com.